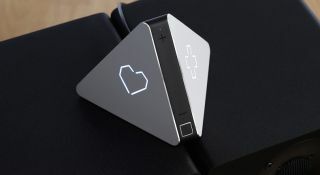 Prizm plays music based on tastes of people in the room | What Hi-Fi? Music curation became central to streaming services in 2015 and the Prizm wants to take it to the next level – choosing music based on the people in the room, time of day, your mood and more. Given an official launch at CES 2016, the Prizm is described as a 'music brain' and connects to your existing speakers or hi-fi system. What it adds, is a unique music curation method. The system will use your existing devices, from wearables to smartphones, and your streaming music subscriptions, to deliver the perfect playlist at any given moment, at the touch of a button. What's more, it will curate a playlist based on who is in the room - combining everyone's music tastes in an effort to keep everyone tapping their toes. It will tailor your music to the time of day and learn your preferences over time to better deliver the right music choices. At least, that's the theory. If you like what you hear you can hit a heart button on the Prizm device to automatically add the track to your Deezer or SoundCloud account. The unit itself uses your existing music subscriptions so claims access to 'up to 35 million tracks'. The device has an Ethernet, USB and minjack audio output, so can connect to any analogue audio inputs on your system. A successful Kickstarter campaign means the Prizm is ready to ship in 'early 2016' for $149, and certainly sounds like an interesting take on solving the 'what music shall I play now?' question.